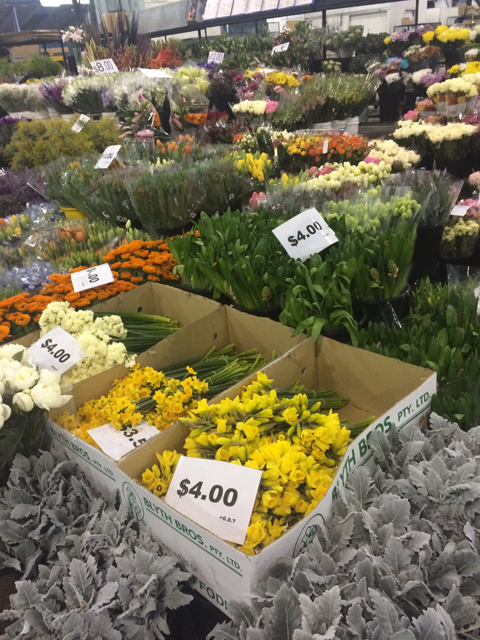 The Sydney flower markets are a place of wonder and beauty; a treasure trove of colour and delight that totally makes up for the early wake-up call! 1)	Wear enclosed shoes and something you won’t mind getting wet or dirty. 2)	Budget! Decide how much you want to spend, and take cash to avoid over spending (Also some growers only accept cash). Its easy to get carried away! 3)	Plan ahead. If there’s a special occasion or a specific spot in your house you want to display your blooms, think of the colour scheme you’d like to stick within. Using a colour scheme that only includes a couple of different colours will guarantee a beautiful, well-balanced outcome. 4)	If you’re not a florist and you are planning to go to market during the week, you don't need to be there at 5am when the market opens. The market is a bustling hive and while you’re standing in the isles admiring some beautiful blooms, there will be plenty of busy people with trolleys and no time buzzing around! The markets are open 5:00 - 11:00am, but I think going anytime from 6am is a calmer, easier time to go. 5)	The big days at market where the stalls are full and freshest are Monday, Wednesday and Friday. The market is calmer and smaller on Tuesday and Thursday, but you can still find plenty of beautiful blooms and a big variety. Just because the market is replenished on Monday, Wednesday & Friday doesn’t mean the flowers are of lesser quality on the other days. 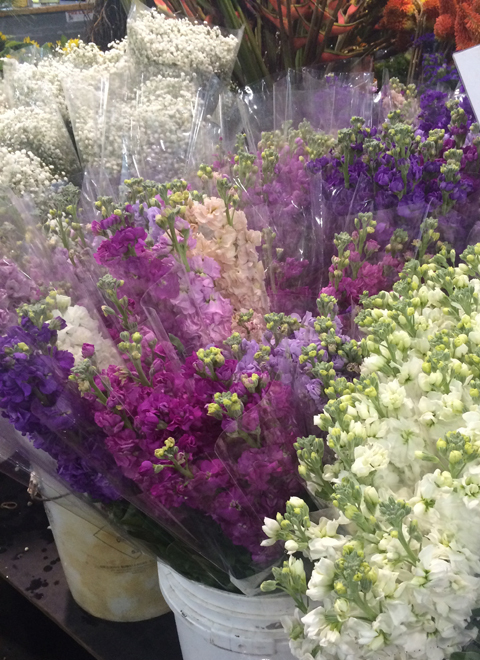 Remember, fresh flowers should last at least a week, depending on the variety. 6)	During the week the market entry fee is $10 but on Saturdays entry is free. You can also get some better bargains on a Saturday, so Saturday is the day to go early so that you get your pick of the blooms. So I went to market with $30 in hand, looking for some fresh seasonal blooms to brighten up my home. 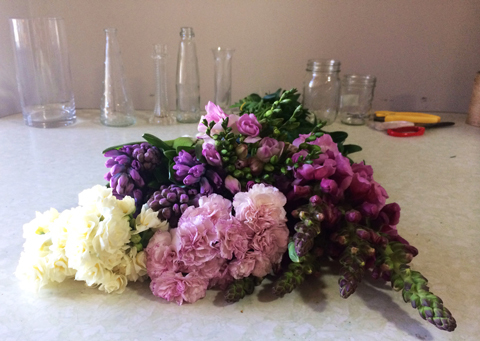 What I came away with was 1 bunch of: Jonquils, Hyacinth, Snapdragons, mini Carnations and Freesia. All in purple shades, except the creamy jonquils. You can buy bundles of foliage at the market, but for home I foraged from the trees in my garden. The cooler months yield all the beautiful bulb flowers so I made sure to get those (Jonquils, Tulips & Hyacinth). Before you start, gather up the essentials: floral/sharp scissors or secateurs, some string or elastic bands to tie your creation, and your vessel (a vase, jar, bottle, or collection of all of these). 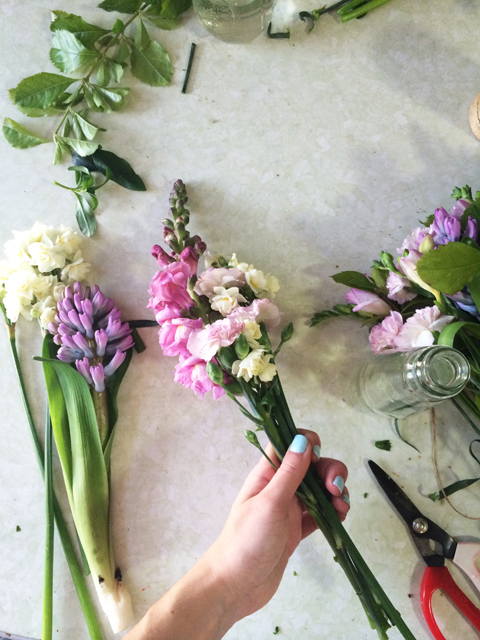 Before you start creating you need to clean your flower stems. Any leaves that are in the water will increase bacteria in the water, which not only makes the water smelly, but your beautiful fresh blooms won’t last as long! So, with a firm but gentle grip, you can strip about a third of the stem so that the bottoms are free of any foliage. This also makes placing your flowers a little easier later on. Make sure you are gentle in the process. Some flowers, like carnations, have fragile, easily breakable stems and may need to be picked off one by one. Now you’re ready to get creative! For a tall arrangement it’s easy to make a front facing arrangement that can sit in an entry way or bench space against a wall. An easy way to achieve this look is to start by placing your greenery (freshly gathered from yours or your neighbour’s garden) in the vase first. This will give you a lush base to thread your flowers into, holding them in place. 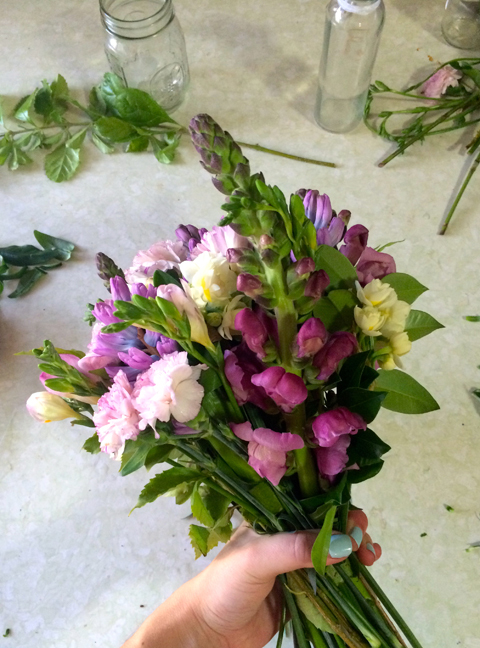 Start with your tallest flowers at the back, measuring & cutting as you go. Remember that golden rule: measure twice, cut once? It still applies with flowers! So with your tallest flowers in, start working your way forward, and down. Place flowers evenly, but rather than placing them completely symmetrically, try staggering the heights of your blooms to add some interest. Keep adding foliage where needed, to help prop up flowers and prevent them from leaning on each other – you want to see every beautiful bloom in your creation! Your flowers should form a focal area at the front and centre of the arrangement, just above where the vase starts. Add some string, ribbon or hessian around your vase to complement your flowers, & enjoy! This front facing style is perfect against a wall on a sideboard, bench etc. Don’t love the front facing look, or prefer something for you coffee table that can be viewed from all angles? No Worries! It’s easy to create an all-round look. First, choose the vessel you will be putting the flowers in. I chose an old ball jar with a wide mouth, but not too tall so I can still include my shorter flowers. Next, cut a length of string, or find an elastic band. This will be for binding your bunch a little later on. I start with a single flower & some foliage in my hand, lining up the stems so they are parallel, and keep adding flowers and foliage around this base. 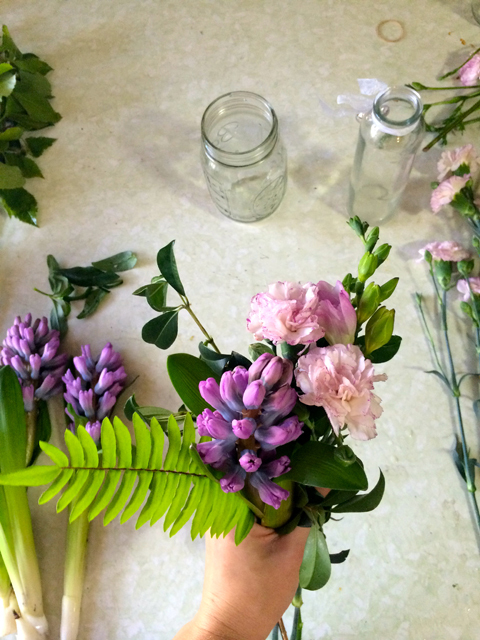 This time we’re making the flowers on-hand. Try to pick one hand & avoid continually swapping, to avoid flowers moving out of place. 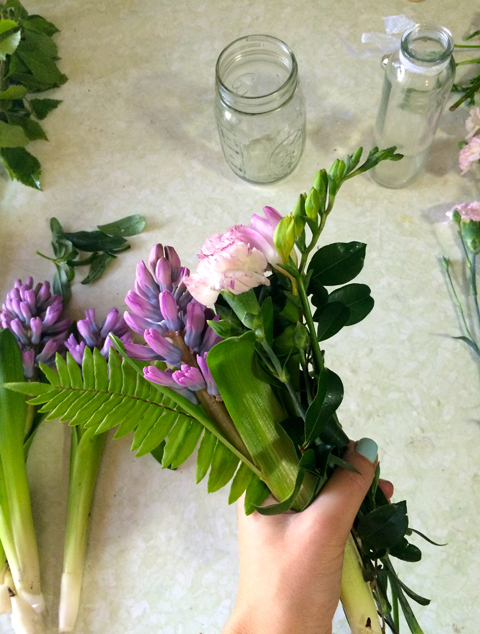 Be sure to turn your flowers in your hand and add flowers to each side evenly. Not doing this could result in a flat side or a less rounded shape in your final product. For a more floral look, place your foliage down lower than the flower heads. This will still give space between flowers, but you won’t see as much green. If you love the lush look, keep that foliage up! It’s all up to personal preference. I like to stagger my flower heights so that the flowers I started with are slightly higher & create a slightly round look, allowing you to see all the flowers at once. 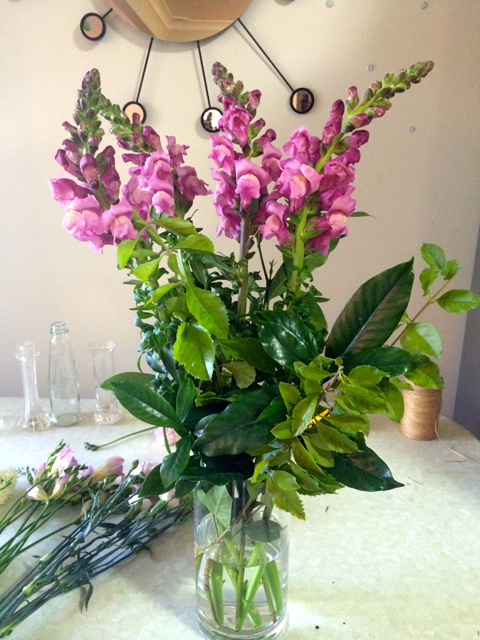 Of course some flowers, like my snapdragons, beg to stand out taller than the rest, so we let them. It’s a good thing they're beautiful! As I place the last few stems, I stagger down the sides to make an interesting profile view. If the flowers suddenly stopped all at one level the bunch might look a little lacking. I used almost all of my flowers in the bunch. When I was happy with the look, I used my trusty string, which I prepared earlier so I wouldn't have to put down my flowers and ruin all my hard work. I tied off my bunch firmly and tightly, but not too tight! 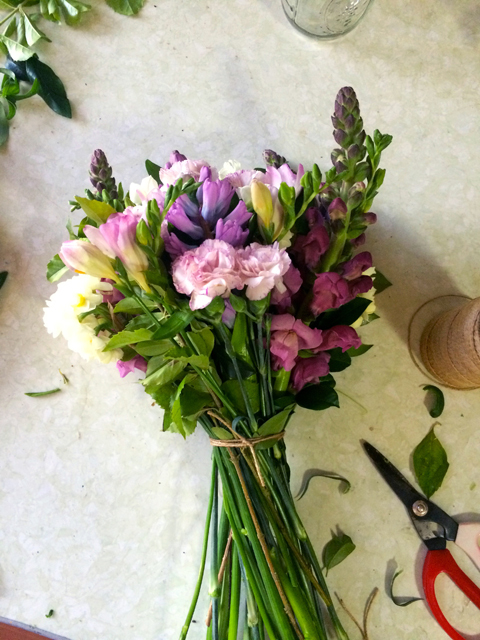 Remember, flower stems can easily snap or be cut-into if the binding is too tight, so be firm, but don’t strangle. Now you can cut your stems. Measure against you vessel and cut the stems. Flower stems cut on a diagonal angle have more surface area to drink from, and flowers do love water! Place in your vase, and enjoy your beauties. Now, should you like to scatter floral love all through your home, or along a table for a party, the mix & match look is for you, and it’s quite adorable. 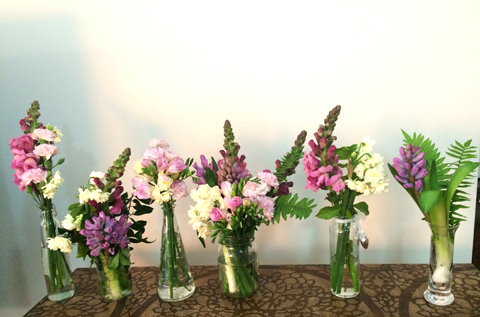 Collect various jars, bottles, and small vases, and scatter the flowers between them. 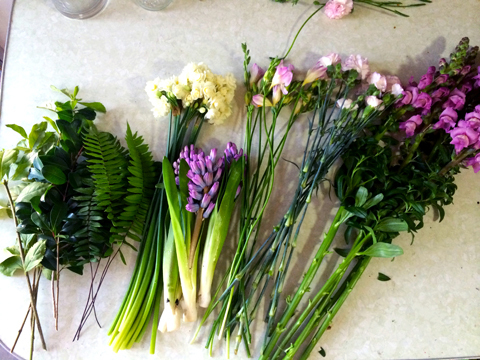 I like to make each one different – not using the exact same flowers in each – so that each little posy is unique. Some vessels will fit more stems than others and that’s okay. With the bottles that only fit a few stems, I like to stagger the heights of the flowers a little more. Also make sure you turn your vessel as you are placing the blooms, to make sure you can see something beautiful at every angle. I filled 6 small vessels with my 5 bunches of flowers and had a little left over. Remember any snapped heads (which happens, though dreadfully sad) can also be scattered around the table or at the base of you vase. Nothing goes to waste. Now you have the perfect decoration for your next party, or just to brighten up little corners of the home. 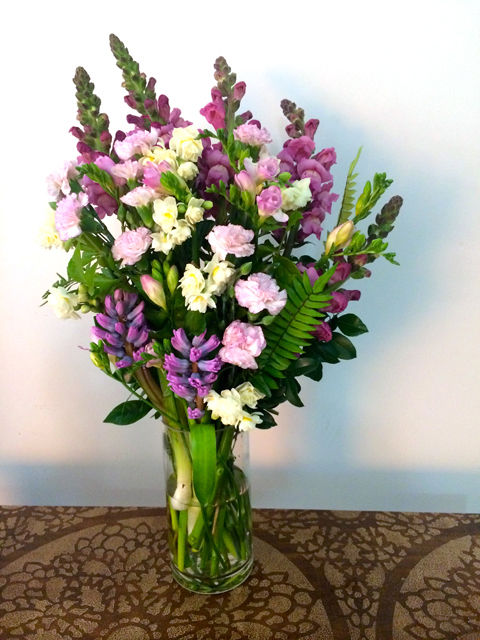 To make the most out of any flowers, remember to re-cut the stems and change the water every couple of days. This should see your flowers last at least a week, potentially more. To give the water a little kick you can put in about half a teaspoon of sugar to act as flower food, and a tiny dash of bleach to keep the water clean, preventing it from becoming that awful stinky mess we all know. If you cut you stems and refresh your water every other day, the flowers will be much happier and will give you more life, brightening up your home & bringing a smile to your face with every passing glance. Enjoy, and appreciate your little beauties! 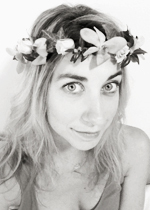 Sian is a 27 year old Sydney florist. Her passion for flowers started as a hobby through gardening and playing with blooms at home, and she has been working professionally for a year now and is in love with her job! With every morning comes a new an interesting flower or foliage, expanding her knowledge and love of the trade. Follow Sian on Instagram for more beautiful blooms.